The Lincolns had long had a special fondness for her. Mary found in her sister someone in whom she could confide her torments. “She and Brother Lincoln pet me as if I were a child, and without words, try to comfort me,” Emilie wrote. “Kiss me, Emilie, and tell me that you love me,” Mrs. Lincoln told her half-sister one morning. “I seem to be the scape-goat for both North and South.”4 At that point, President Lincoln entered the room and said: “I hope you two are planning some mischief.’ Mr. Lincoln told Emilie later that day: “Little Sister, I hope you can come up and spend the summer with us at the Soldiers’ Home; you and Mary love each other – it is good for her to have you with her – I feel worried about Mary, her nerves have gone to pieces; she cannot hide from me that the strain she had been under has been too much for her mental as well as her physical health.” Both Lincolns expressed separate concerns to Emilie about the other’s mental and physical health. Katherine Helm, Mary, Wife of Lincoln, p. 216-217. Michael Burlingame and John R. Turner Ettlinger, editors, Inside Lincoln’s White House: The Complete Civil War Diary of John Hay, p. 128 (December 13, 1863). Harold Holzer, editor, The Lincoln Mailbag, p. 117. Roy P. Basler, editor, Collected Works of Abraham Lincoln, Volume VII, p. 485. 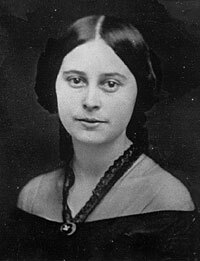 Ruth Painter Randall, Mary Todd Lincoln, Biography of a Marriage, pp. 309-310. Gideon WellesGideon Welles Diary Volume II, p. 21. Elizabeth Todd Grimsley, “Six Months in the White House,” Journal of the Illinois State Historical Society 19 (Oct.-Jan., 1926-27): p. 57. Fletcher Pratt, Stanton: Lincoln’s Secretary of War, p.407.